I'll take the nation to the next level - Lowassa. 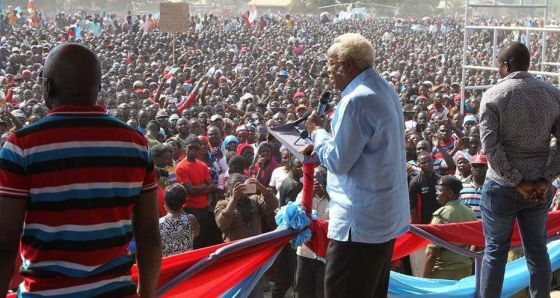 Chama cha Demokrasia na Maendeleo (Chadema) presidential candidate, Edward Lowassa, has unveiled his execution plan for what he considers as the main challenges facing the people which he gathered on his countrywide campaign trail ahead of tomorrow’s general election. In his televised address to the nation yesterday evening, Lowassa highlighted a wide range of issues touching on people of all walks of life, promising to tackle them within the shortest possible time soon after clinching power. “My countrywide campaign trail has given me an opportunity to learn myriad serious issues facing the people. I have learnt that people in rural as well as urban areas really need change and their readiness for change,” Lowassa said as he extended special gratitude to the Coalition of People’s Constitution (Ukawa) leaders, including fellow CCM defectors, Mzee Kingunge Ngombale-Mwiru and former Prime Minister Fredrick Sumaye and her wife Regina. Poverty, ignorance and disease top the list, as he vowed to make education his first priority, providing free education to all from basic up to university level. Signalling the importance of National Service (NS), Lowassa promised to increase its enrollment fivefold as well as improve technical and entrepreneurship skills provided to youth during NS training. “If elected, my government will eliminate all nuisance taxes affecting small-scale traders, food vendors and petty traders,” he said, adding that all taxes imposed on farmers, herders and fishmen and women would be abolished as a way to empower them to work hard in improving food security in the country. While promising to improve government relations with investors, he expressed his intention to give special attention to locally manufactured products with a view to making them competitive. “Tanzania leads in East Africa and the SADC (Southern African Development Community) in terms of multiple taxes. We are going to devise a friendly tax system that will enable us compete globally,” he said, adding that the country, under Chama Cha Mapinduzi, was no longer competitive in both local as well as international markets due to poor infrastructure and bureaucracy within government. He noted that out of 160 countries surveyed by the World Bank on infrastructure this year, Tanzania ranked 138th, far behind the landlocked countries of Malawi, Rwanda and Burundi, which ranked at 73, 80 and 107. Kenya was ranked at 74. Lowassa also promised to improve primary health services to all citizens and improve preventive health services in order to avoid excessive medical costs. He promised to invest in building more hospitals and health facilities to save the costs incurred on foreign medical facilities. His government would also provide allowances to the elderly and the disabled to ensure they led dignified lives. He also touched on the issue of public expenditure, saying his government would abolish the use of luxury cars, cut local and foreign trips for government officials, and reduces flying on first class. Lowassa, who is supported by four opposition parties which form Ukawa, promised to give local entrepreneurs special investment opportunities in the country’s promising oil and gas sector. He also reiterated his desire to stabilize the Treasury department and give it the full mandate to supervise public and private companies in which government owns shares. He was firm on how his government would combat corruption in various areas, including the county’s ports, taxes and vowed to abolish unnecessary tax holidays to save million of shillings being lost on a weekly basis. Lowassa reiterated his promise to create new job opportunities through improved agriculture, industry and tourism sectors. “We are going to improve infrastructure and build a railway network, starting with overhauling the central railway line as well as constructing the Tanga-Arusha-Musoma railway network,” he noted, adding that improvement of the current country’s ports was on top of his agenda. He promised also to purchase new passenger and cargo vessels on the country’s major lakes of Tanganyika, Victoria and Nyasa. Lowassa said under his government, the national airline carrier would be revived and empowered to run profitably. He promised to solve congestion on the roads of the country’s major cities of Dar es Salaam, Mwanza, Mbeya and Arusha. Equally important, Lowassa promised to invest heavily in power generation to ensure that at least 75 per cent of the country’s population got connected within five years of his presidency. He touched on one of the items on top of the Ukawa agenda, promising to ensure that a people’s constitution was realized to safeguard the country’s democratic principles, press freedom as well as empowering civil societies, state organs, parliament and citizens to operate in a responsible manner. He also pledged to strengthen the union that forms the United Republic of Tanzania. Good governance, rule of law and human rights also featured on his crucial agenda as he promised to form a special commission to review minimum wages for employees in the public and private sectors. The Chadema presidential candidate also promised to strengthen regional and international relations, solidifying current ties with the East African Community (EAC) and Southern African Development Community (SADC) blocs, the African Union (AU) the United Nations and other international organisations.